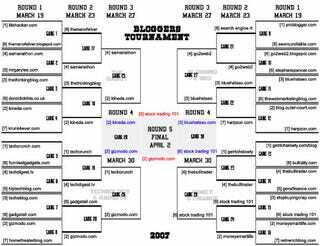 In a battle that seemed decidedly one-sided, Gizmodo trounced Kineda.com to make it to the championship round of the Bloggers Tournament 2007, and voting is going on now to decide which website will be the grand champion: Gizmodo, or Stock Trading 101? So now we ask you to vote for the Giz once again in this antithesis of that old maxim, "Why don't you pick on somebody your own size?" Voting ends tonight at 11:50 p.m. CDT. Thanks to everyone who voted for us and brought us all the way to the finals. Let's take home the trophy and the glory—yet one more honor for the Giz! See the full-sized bracket, after the jump.